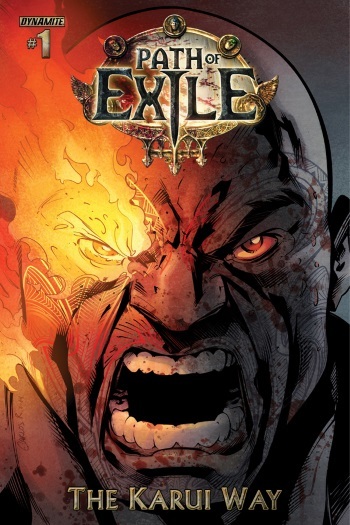 A four-issue comic book series will explore new lore from an upcoming Path of Exile expansion. Path of Exile developer Grinding Gear Games announced today that the free-to-play action RPG is getting a comic book series. The developer has partnered with Dynamite Entertainment to publish the new series. The four-issue run, written by Royal McGraw and illustrated by Carlos Rodriguez, will be based on the existing Path of Exile story and also feature new lore from an upcoming, unannounced expansion. Each 22-page issue will be released digitally this summer, and all four issues will later be combined into a printed graphic novel. Each issue will also include codes for in-game bonuses, such as cosmetic armor effects. McGraw and Rodriguez are working closely with Grinding Gear Games' Creative Director Erik Olofsson and Narrative Designer Edwin McRae. "We are thrilled to be working with Grinding Gear Games on this," says Rich Young, Dynamite's Director of Business Development. "The work being produced by the creative team is really top notch, and it's tying in seamlessly to the game, thanks to Edwin and Erik. I think that fans of Path of Exile are really going to enjoy this series, which adds to the depth of the game, but in a different medium." McGraw has written for Electronic Arts, Syfy Channel, and DC Comics, including issues of Batman Confidential and Detective Comics. Rodriquez's work has appeared in DC Comics' Nightwing and Teen Titans series, and Marvel's Fall of the Hulks: Red Hulk and X-Men Vs. Agents of Atlas. Path of Exile amassed 3.7 million player accounts in 2013, with a peak of almost 70,000 simultaneous players. As of February 2014, Path of Exile had more than 5 million registered player accounts. The Diablo II-esque game has been praised by critics since its launch. While Path of Exile is currently exclusive to PC, the developers haven't ruled out the possibility of a console version.